MERRICK high pressure fabric filters are perhaps the strongest standard fabric filters made today. 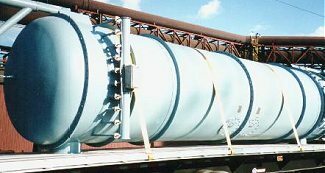 Useful in pressurized or explosive systems, these units are available as a standard up to 100 psi construction with capability to almost any ASME code pressure. High-build epoxy paint as standard. Stainless steel tube sheet and blow pipes are standard. All units available with davit arm for easy maintenance. Top bag removal with snap band connection. Available for almost any pressure; just ask. MERRICK’s smallest high pressure fabric filter ready for shipment. This 24″ diameter unit will withstand 100 psi. MERRICK’s largest high pressure fabric filter to date. 84″ diameter at 50 psi.